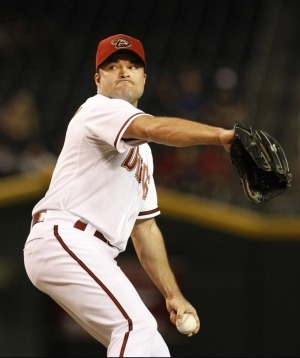 As the season winds down for the last-place Arizona Diamondbacks, team General Manager Josh Byrnes has sent down Mike Hampton, who was signed in August, to double-A, where he will play with the D’backs’ Wii Sports unit. “Due to the spotty play of our recent acquisition, we have decided that sending him to play some Wii Sports baseball will do him some good,” said Byrnes, who had taken some heat for signing the oft-injured pitcher. Some have found this to be yet another sad chapter for the two-time All Star, but interim manager Kirk Gibson thinks this will help Hampton get back into shape. As of press time, Hampton has pitched one game in Wii Sports, allowing 5 runs in 2.1 innings. The D’backs are currently looking for suitors.